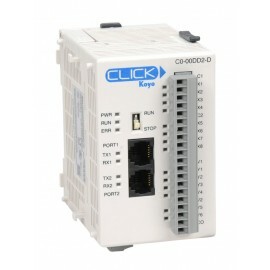 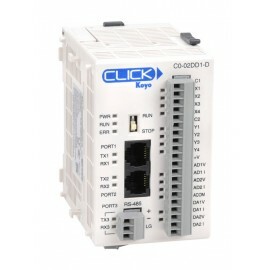 High-speed counter interface module for DL05/06 PLCs. 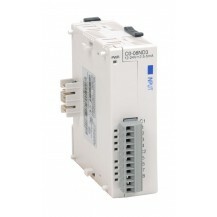 (4) 9-30 VDC sink/source inputs, (2) 5-36 VDC isolated sink/source outputs, 0.5A per point. Inputs supported: 1 quadrature encoder counter up to 250kHz, or 2 single-channel counters up to 250kHz, and 2 high speed discrete inputs for Reset, Inhibit, or Capture. 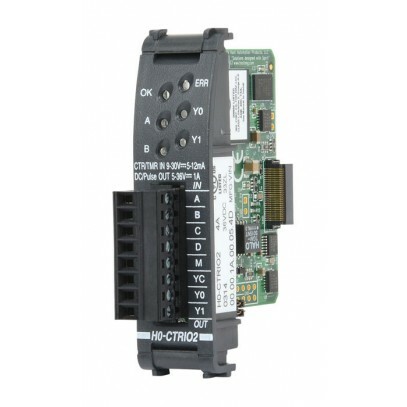 Outputs supported: 2 independently configurable high-speed discrete outputs or 1 channel pulse output control, 20Hz-250kHz per channel, pulse and direction or CW/CCW pulses. Must use with CTRIO Workbench v2.2.0 or higher.